What a pretty caterpillar… or not? You are here: Home / Blog/News / Blog / News / What a pretty caterpillar… or not? Some people only realize , usually from first hand experience that touching or handling various caterpillars can result in excruciating pain. 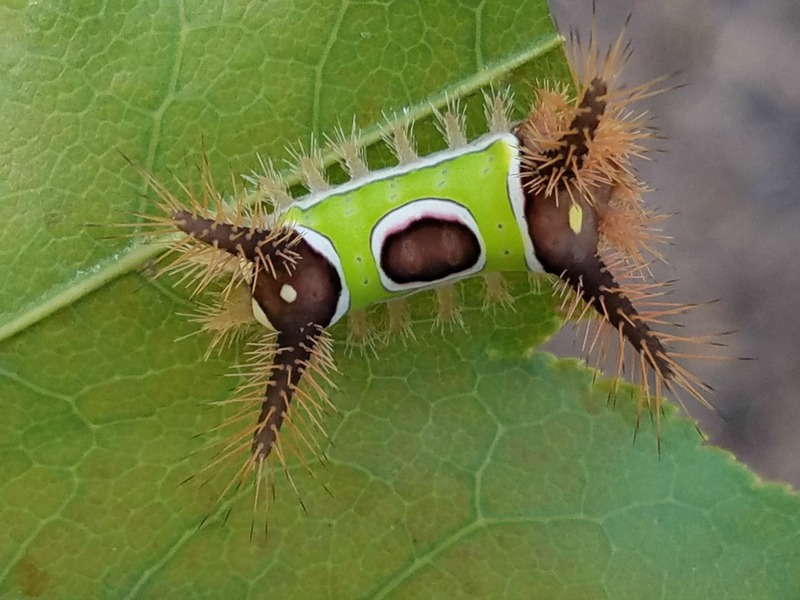 The “Saddleback Caterpillar” is no different. It’s pretty. It’s poisonous. And it’s painful. Typically growing to an inch in length, it has four tubercles – two on each end and protruding from the sides. The “saddle”, which once you see the insect you’ll immediately notice, is an oval purplish-brown spot in the middle of a brightly green patch on its back. This caterpillar generally feeds on host plants that can include apple, cherry, chestnut, corn foliage, oak, pear, plum, rose and other trees during August and September. If you’re unlucky enough to be stung by the hairs or spines of the “saddleback’, you may feel a burning sensation and inflammation similar to that of a bee sting. The irritation and swelling can last a few days and may include early bouts of nausea within the first few hours. Try applying and stripping an adhesive tape over the hairs to remove them and wash the area repeatedly with soap and water to help remove the venom. By immediately applying an ice pack and a baking soda poultice this should help to reduce pain and swelling. Aspirins have appeared to be ineffective for reducing pain & headaches, however an oral antihistamine like Benedryl may help relieve itching and burning. If severe reactions are present, seek medical attention immediately. You can avoid these stinging caterpillars and others by not picking up, swatting or trying to squish them with any part of your body. Use heavy gloves and a long stick to remove them if you come across any unknown caterpillars. When harvesting corn, wear long sleeves, pants and gloves to help reduce any possible stings. 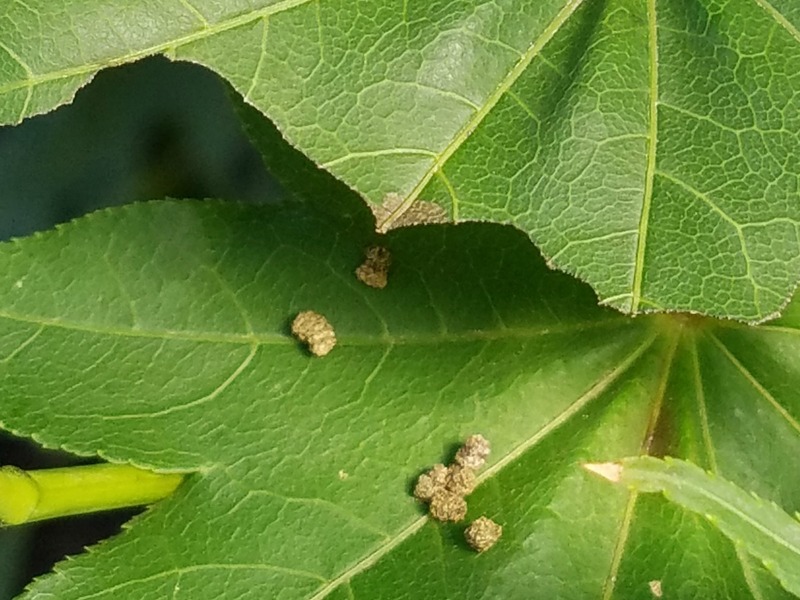 Generally the “saddlebacks” aren’t found in a large enough numbers to warrant using a spray, however if you come across an infested shrub or tree, you can use Sevin as well as various pyrethroids labeled for shrubs & trees. Be sure to follow the manufacturer’s directions on the bottled products.